Sign Effectz, Inc., an innovative custom sign manufacturer in Milwaukee, WI, announced its design and manufacturing collaboration with Therese Lahaie, a professional artist in Emeryville, CA. Her art commission project, “Crossing Signal Mosaic.“ is a ceiling mounted light sculpture composed of programmed, DMX-controlled LED boxes that display a pulsing array of pedestrian crossing signal imagery. The mosaic system is roughly 15’ x 40’ long and contains 32 custom light cabinets that project images on a Lucite Lux diffuser lens. The programming of the mosaic can be compared to conducting an orchestra. Public Art project, “Crossing Signal Mosaic“, is a ceiling mounted light sculpture composed of programmed, DMX-controlled LED boxes that display a pulsing array of pedestrian crossing signal imagery. It is a result of the design and manufacturing collaboration between professional artist Therese Lahaie in Emeryville, California and Sign Effectz, Inc., an innovative custom sign manufacturer in Milwaukee, Wisconsin. 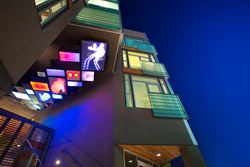 In a competitive housing market, real estate developer Equity Residential wanted a work of art that would illuminate its building and attract young tenants. The City of Emeryville Art in Public Places Committee sought an installation that would combine art and technology to reflect a focus on neighboring businesses and companies. The entire system is roughly 15’ x 40’ long and contains 32 custom light cabinets that project images on a Lucite Lux diffuser lens. For Ms Lahaie, core functionality, aesthetics and internal workings were the top challenges. This is where the relationship started and the problem solving began. Project management is a key element in the Sign Effectz product development process. Conformed schedules are required to keep everyone on the same page. First on the list were weekly meetings with Ms. Lahaie to determine practical courses of action and dismiss those that were not applicable. Sign Effectz recommended various innovative materials and methods to make her artistic vision a reality. Sign Effectz, Inc. started by building a 3D CAD model, incorporating a number of LED light sources. Test driving the LED light sources in a 3D environment allows for quick decisions, without having to fabricate prototypes for testing. The model consisted of 6 segmented zones in each box with an aluminum panel diffuser and laser cut images. The LED light is placed behind the laser cut opaque sheet, casting an image on the backside of the Lucite- Lux lens. Sign Effectz assembled the 15’ x 40’ structure, in it’s entirety and did system checking, while in Wisconsin so the installation in California would go without a hitch. An extensive series of shop drawings ensured that what was fabricated accurately represented Ms. Lahaie’s vision. Numerous decoders, power supplies, LED’s, count down timers, etc. meant the wiring schematic were quite elaborate. The mounting frame assembly was similar to putting together a toy erector set. It was a frame structure installed in the ceiling with bolts, nuts and screws fastening it together. The computer control system has several access options. If needed, the mosaic could be programmed with a computer in the utility room by direct connection, but it can also be connected via WIFI. The WIFI allowed Ms. Lahaie to be in front of the sculpture when programming the mosaic’s illuminated production. This allowed for viewing during the programming process. Before leaving California, the Sign Effectz installation team ran the mosaic through rigorous test cycles. It performed beautifully and passed with flying colors. Due to its elaborate nature and over 1000 electrical connections, one of those connections would typically have a bug in it, but there were no failures. The team is delighted that it has been running perfectly since the install in March, 2015. The mosaic won the Lucite Lux “Just Imagine Award” for public art. The JUST IMAGINE Awards celebrate designers who embrace the originality of working with and creating light sculptures using LuciteLux® acrylic. About Sign Effectz: We are the company revolutionizing the relationship between art and signage. Sign Effectz, Inc. is a custom manufacturer that blends creativity with technology to provide visually effective and physically durable signage.